Tanzania is home to three of Africa's great mountains, Mt Kilimanjaro (5,895m), Mt Meru (4,565m) and Ol Doinyo Lengai (3,188m). Your mission is to complete the Three Peaks Africa Challenge, a unique and distinctive way to climb these three peaks in just over 2 weeks. To stand at the summits and to beam down with an overwhelming sense of achievement as you utter the words ‘I did it’. To discover a world of remarkable adventures, meet and hear stories from incredible people and to accomplish something extraordinary. Our job is to do everything that we possibly can to help make sure you get there. Most of all we want you to love the outdoors as much as we do, and to have the confidence to push your boundaries. And we will be with you every step of your journey to achieve your goal. So join us in discovering a new and exciting way to see Africa to complete THE ultimate hiking challenge. Don’t be content with the same old routine. Do something unique that you will remember for a lifetime. What is the Three Peaks Africa Challenge? The Three Peaks Africa Challenge is the ultimate once-in-a-lifetime adventure challenge brought to you deep from the heart of the African Savannah. 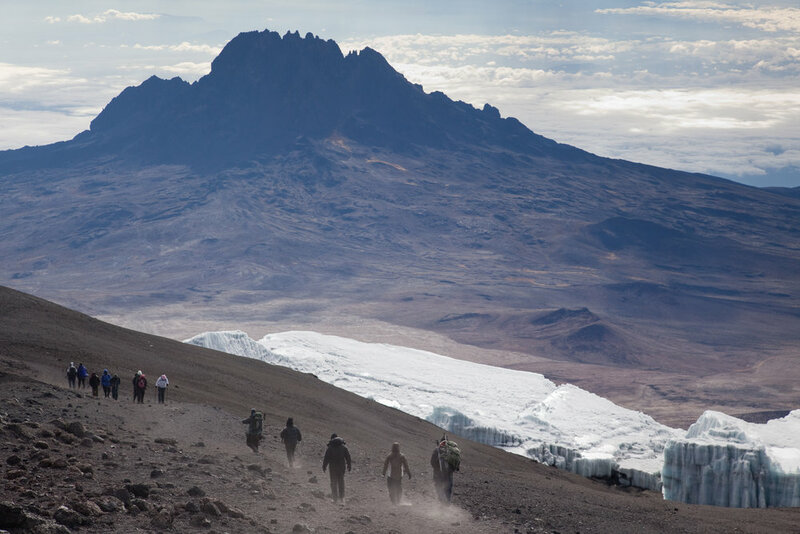 Not only will you be ticking off one of the Seven Summits and the tallest free-standing mountain in the world, Mt Kilimanjaro, but by the time you stand on Uhuru Peak you will have already reached the giddy heights of Mt Meru and active volcano Ol Doinyo Lengai. Often overshadowed by their big sister, these mountains provide travellers with the opportunity to step off the beaten track. With large parts of Africa still largely untouched, the complete Three Peak Challenge will feature some of the most bio-diverse and culturally distinctive places on Earth, famous for its abundance of wildlife and birdlife: giraffes, buffalo, bushbuck, elephants, blue monkeys, to name just a few. So whether you are an experienced adventurer, or just starting out your hiking adventures, this is the perfect opportunity to take on one amazing two-week challenge. Interested in finding out more? Visit our Advanced Route and Challenging Route pages to see what you could be doing on your two-week African adventure and find out more about each route and to sign up! It is important to us that travel is seen as a force for good, and we increasingly believe that we all have a collective responsibility for our impact on the environment, and to the local communities whom we rely on when we go on our travels and do these amazing things. We are committed to supporting ethical and responsible travel initiatives, partnering only with local operators and companies who align with us ethically in ensuring that our practices have a tangible benefit to the local community, economy and environment. Porters are Tanzanians who work freelance and often depend on tourism on the mountain for their livelihood. We believe as trekkers we have an overwhelming collective responsibility to make sure that they aren't being exploited. Educating the public on the porters’ working conditions and providing guidelines for Proper Porter Treatment. For details of the recommended porter treatment please visit the Kilimanjaro Porters Assistance Project website. We are passionate about helping to improve porter working conditions and rights and have a number of initiatives, including our crowdfunding campaign that we ran, to help support the great work currently being done in Tanzania. If you would like more details on how else we are looking to help, improve and raise awareness of porter and other mountain staff working conditions, please have a look at our Kilimanjaro Porters Campaign page or email us at info@threepeaksafrica.com. Equally, we feel that it is important that we operate with the philosophy of leaving no trace and doing what we can to encourage the circular economy. With this in mind, in 2019, we are keen to focus on launching our kit swap programme. The programme will serve a triple purpose: encouraging recycling, reducing the additional kit costs to you, and benefiting the community upon whom we depend when we are on the mountain. It is designed to help you source some of your items of expedition kit at a reduced cost, with full profits from the initiative going towards the efforts of improving porters’ working conditions in Tanzania. We understand that the expedition kit can be expensive, and we want to help you make it easier to do these amazing challenges. We are open to clothing kit donations or will purchase items of unwanted kit (in good useable condition), and are able to offer this to individuals who are looking for mountain kit at a much reduced cost. For any items of kit that are not sold, these will be given as donations to the Tanzanian porters. Individuals on our expeditions will be offered the opportunity to contribute to this initiative by helping to transport some of these items donated in the UK to Tanzania. We are keen to reach out to outdoor sponsors who may be able to help with this. If you have any questions in relation to the programme or if you have any items of unwanted kit looking for a good home please contact us on info@africathreepeaks.com. Be part of an amazing community. By signing up to the Three Peaks Africa Challenge you are signing up to spending two weeks in the company of daring adventure-seekers curious to push the boundaries of daily life to achieve something different, and committed to give back something great to the local community. Every great challenge needs a great team of people supporting them, whether they are on the mountain or at base camp. You will need determination, tenacity, physical and mental strength, an overwhelming sense of adventure and love of travel in order to succeed. But when the going gets tough you can take comfort in the fact that you have your team of fellow expedition mates supporting you every step of the way. When you stand at the summits of the Three Peaks, you won’t be standing with just any old teammate, you’ll be standing with some of the best friends you will ever get to meet. You’ll be standing with family. Back at base camp, our experienced and dedicated support team on the ground have worked hard to design the challenge in a way to give you the most amazing experience, and to ensure you have the best chance of summiting all three peaks. We will be here to help you achieve your aim, both in the run-up and during your challenge. My travel adventure bug all started from a corporate charity challenge which I had helped to organise for 100 people to climb Kilimanjaro in 2010. Prior to that, the extent of my exercise would have probably consisted of the last minute dash for the bus and certainly at most a 5K run. And if I were being honest, even that would have been met with some resistance. Unsurprisingly, the idea of spending seven days hiking up and down a mountain had never even crossed my mind. So when the email appeared in my inbox in April 2010, silently willing me to ‘sign up to climb Kilimanjaro’, it stirred a nagging curiosity to try something different and to see what other experiences travelling could bring. Little did I know what a big impact it would have on me. Looking back, as habitual creatures we are often guilty of falling into the trap of getting stuck in the same old routine of where to go, what to do, reluctant to push the boundaries of our own comfort zones. Ironically it was in an inflight magazine where I read that ‘the real reward from travelling comes from stepping outside ourselves, our fixed views, beliefs and habits and experiencing the reality through the eyes of the locals or even those of our fellow travellers’. With that, I took the magazine’s advice and used hiking as an opportunity to step off the beaten track and travel to far-flung regions of the world. From the trails of Peru and Colombia to the tip of South Africa, jungle trekking in Borneo and onwards to the Alps. In just seven years, my love of the outdoors and for adventure has sky-rocketed to a whole new level. In a nutshell - and if you haven’t already guessed - I just love it. So be bold, go out there and make your journey. Life is far too short for ‘what if’.